“Blade Runner: 2049” director Denis Villeneuve looks ready to jump into another classic fixture from the sci-fi world. 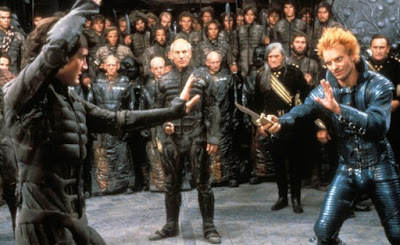 Sources tell Variety that Villeneuve is in early talks to direct Legendary’s “Dune” reboot for the company. Legendary has not commented on the news. Prior to the Thanksgiving holiday, Legendary closed a deal with the Frank Herbert estate for the rights his iconic novel, granting the production entity not only rights to film but also TV-based projects on the sci-fi property. The projects would be produced by Thomas Tull, Mary Parent, and Cale Boyter, with Brian Herbert, Byron Merritt, and Kim Herbert serving as executive producers. Set in the distant future, “Dune” tells the story of Paul Atreides, whose family accepts control of the desert planet Arrakis. As the only producer of a highly valuable resource, control of Arrakis is highly contested among competing noble families. After Paul and his family are betrayed, the story explores themes of politics, religion, and man’s relationship to nature as Paul leads a rebellion to restore his family’s control of Arrakis. The novel was also adapted as the 1984 film directed by David Lynch. The film starred Kyle MacLachlan and at the time was thought of as a flop, getting poor reviews and grossing just $30.9 million, but more recently has attained cult status. It’s unknown if Villeneuve would be involved in any TV-related projects, just that he would direct the first film to come out of this new universe. The director has already delivered three original projects that have over-performed at the box office while also being critically applauded as award season contenders. His latest, “Arrival,” opened with $23 million at the box office and has already earned $94 million worldwide on a $45 million budget. Following those successes, he was handpicked by Ridley Scott to help reboot the “Blade Runner” franchise with “Blade Runner: 2049,” which bows next October and stars Ryan Gosling and Harrison Ford, who reprises his role as Detective Rick Deckard.